A royal love triangle, a fight for freedom and the famous ‘Triumphal March’ will light up the sky when Aida comes to the beach in 2017. It’s a night at the theatre, re-imagined for the kind of evening where you couldn’t bear to go inside. A huge cast and orchestra perform Verdi’s famous music in a new production featuring fireworks of the vocal and exploding kind, colourful costumes and local surf life savers parading past you on the sand. We open the site at 5pm, so arrive as the sun is setting and take in the view with a glass of bubbles as dusk falls. Meet your friends and family for an alfresco dinner, then settle in for a night of singing and spectacle at the water’s edge. There are three pop-up bars at Coolangatta Beach, exclusively for Griffith Opera on the Beach — Aida. The flavours of northern Africa and the Middle East come together in a range of menus designed to complement Verdi's Egyptian masterpiece. See the menus. Let us prepare your picnic for you with the Radamès Hamper ($95 for two) or Amneris' Basket ($75 for two). All you have to do is pick up your picnic basket from the Foreshore Beach Bar when you arrive at Griffith Opera on the Beach. Inside will be premium quality disposable plates, cutlery, and napkins. Simply add the hamper of your choice to your cart after selecting tickets for Aida on the Beach. If you already have tickets, sign in to your account and go to 'upcoming performances' to add a hamper. The A-reserve seating section includes a low-set beach chair on the sand. Seats are not allocated, and are by general admission. B-reserve and C-reserve seating is on the sand. You can bring your own blanket or chair (but the back of the chair should be no taller than 80cm from the ground). The performance of Griffith Opera on the Beach — Aida on Friday 22 September was cancelled due to extreme weather conditions. Ticketholders should contact the customer service centre where tickets were originally purchased to arrange an exchange or refund. To exchange into the performance on Saturday 23 September, please visit the box office at Coolangatta Beach from 10am on Saturday 23 September. To exchange into a performance of Aida on the Beach on 28, 29 or 30 September, or to organise a refund, please call from Monday at 9am. 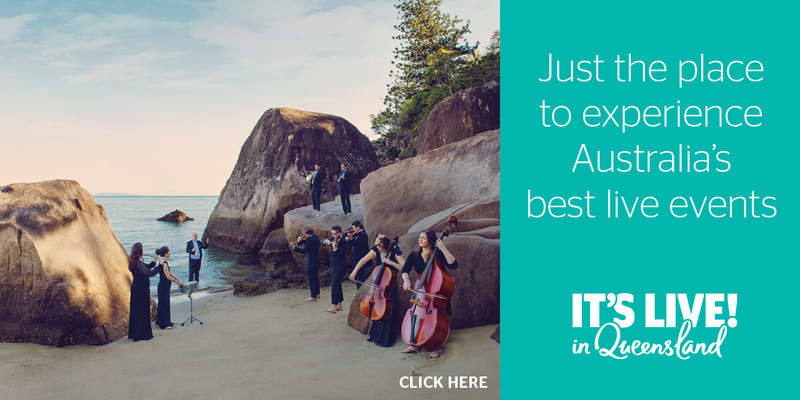 Travelling to the Gold Coast for Opera on the Beach? Check rates from Aida’s official hotel partner, Sofitel Gold Coast. Ticket and accomodation offers are available with Qantas Holidays. Looking for things to do while you visit the Gold Coast for Opera on the Beach? Check out these ideas. Presented by Opera Australia in partnership with City of Gold Coast and Tourism & Events Queensland and in association with Bleach* Festival. Running time: approximately 2 hours & 40 minutes, including one 30-minute interval. Griffith Opera on the Beach: Aida is located at Coolangatta Beach, Marine Parade, Coolangatta, Gold Coast (near the corner of Marine Parade and McDonald Street). All seating for Griffith Opera on the Beach is on the sand. Premium, A-reserve, B-reserve and C-reserve are all seated by general admission so we recommend arriving early. There is no undercover seating. In the Premium section, standard chairs will be provided and will be on a hard surface. In the A-reserve section, a low-set beach chair on the sand will be provided. If you're sitting in B-reserve or C-reserve on the sand (no chair provided), you're welcome to bring your own chair (but the back of chair should be no taller than 80 cm from the ground). If you don't want to bring a chair, we recommend bringing a blanket, towel, or beach mat to sit on. The venue, audience seating, and the stage are completely uncovered. The event is an all-weather experience and Opera Australia is committed to going ahead with a performance of Griffith Opera on the Beach even in doubtful or unfavourable weather conditions. Please come prepared so that you are as comfortable as possible, and ready to support the performers, who will carry on singing in the rain. The weather is full of surprises so we recommend that you dress with this in mind and bring warm, weatherproof clothing. Please note that although umbrellas can be brought to the venue, out of consideration for other members of the audience they cannot be used during the performance. We will only cancel a performance during electrical storms (within 10km radius) or during times of extremely high winds and/or rain. The decision to cancel a performance is not made until 6.30pm or later and a cancellation may be called during the performance. Please plan to travel to the venue for a 6.30pm performance start time even in unfavourable weather conditions. In some weather conditions Griffith Opera on the Beach may have a delayed start time or be paused for up to 50 minutes at any point throughout the performance. If you're travelling from the northern Gold Coast by public transport, the G-Link (light rail) can take you from Surfers Paradise or Southport to Broadbeach. From Broadbeach, Gold Coast bus 700 departs and goes through Mermaid Beach, Miami, Burleigh Heads, Palm Beach, Currumbin, Tugun and Bilinga to Coolangatta, taking about 45 minutes. Travelling from Brisbane to Coolangatta via train is an option, and takes about 2 hours. Take the train from Brisbane to Varsity Lakes, and Gold Coast bus 760 can take you from there to Coolangatta. Gold Coast bus 700 operates extended hours on weekends, with late night services that will depart post performance, however Gold Coast bus 760 does not. This information is provided as a guide only. Please plan your journey at translink.com.au or call 13 12 30. If you're travelling from Brisbane or from the south, the main route is via the Pacific Highway. The drive from Brisbane to Coolangatta takes about 1 hour and 15 minutes, depending on traffic. If you're planning on travelling by car, please be advised that there will be road closures due to the event, and traffic congestion is likely. Details on road closures will be posted here closer to the event. Limited parking is available close to the venue and we highly recommend arranging an alternative drop off/meeting point, or using public transport if you can. Details on parking options will be available closer to the event. Gold Coast Cabs on 131 008 or (07) 5588 1234 if calling from outside of the Gold Coast. You can also book online at www.gccabs.com.au. Tweed Heads Coolangatta Taxi Service on 133 422 for bookings from Tweed Heads, or on 1300 656 818 for bookings from other areas. Or visit tweedtaxis.com.au. There is a taxi rank located outside the entrance of The Strand at Coolangatta on Marine Parade. Opera Australia is committed to the rights of all people to experience our events. As such, we have implemented specific access measures for Griffith Opera on the Beach: Aida to welcome guests with access needs. For access information please contact Opera Australia on +61 2 9318 8200 (Monday to Friday, 9am to 5pm) or QTIX ticketing offices on 136 246. What time does the venue open, and when does the show start? The venue opens at 5pm, and the performance will start at 6:30pm. There are no rules about what to wear at an opera performance. It is always great fun to frock-up for the occasion and make a glamorous night of it, but dressing up is not mandatory. This is an outdoor event so most importantly dress for all weather conditions and sitting on the sand. There are three pop-up bars at Coolangatta Beach, exclusively for Griffith Opera on the Beach — Aida. See the menus. There are no cloak room facilities available. We don't recommend that you bring large or bulky items or items of significant value. Griffith Opera on the Beach is General Admission with allocated seating reserves (Premium, A, B and C). There is no undercover seating. In the Premium section, standard chairs will be provided and will be on a hard surface. In the A-reserve section, a low-set beach chair on the sand will be provided. If you're sitting in B-reserve or C-reserve on the sand (no chair provided), you're welcome to bring your own chair (but the back of chair should be no taller than 80 cm from the ground). If you don't want to bring a chair, we recommend bringing a blanket, towel, or beach mat to sit on. Camping chairs will not be permitted on site. Can I take my seat if I arrive late? To ensure the enjoyment of all audience members, we are unable to seat latecomers until a suitable break in the performance. This break may not be until interval. Can I purchase food and drinks at the venue? A range of food and beverages will be available at the venue from 5pm. See the options. Only beverages purchased at the venue will be permitted – sorry, no BYO. And of course, you must be over 18 to purchase or consume alcohol at the venue. There won't be any ATM facilities at Griffith Opera on the Beach. There are ATMs very close by on Marine Parade. How will I follow the story if it's in Italian? Aida is sung in Italian with English surtitles. Don’t worry if you can’t follow every word as the action will convey a great deal of the story. If you wear glasses make sure you bring them along. There will be one 30 minute interval so you can have a drink, freshen-up and stretch your legs. When you hear the bells ringing, it's time to return to your spot. Opera audiences are famous for their passionate involvement in the performance. Don't be alarmed if the people around you start stomping their feet at the end of the performance, this is an opera tradition to show your enjoyment and appreciation, feel free to join in if you like. All applause will be gratefully received, although it is polite to wait until the singing and music has stopped. The recording (audio or video) and taking of photos (including camera phones) during the performance is prohibited. Please feel free to take photos of the venue before and after the show. Can I leave my phone on during the show? We request that mobile phones are turned off prior to the performance. If you must keep your phone turned on, please place it on silent. Remember that light from your phone is distracting to other audience members. Can I bring my children to Aida on the Beach? People of all ages are welcome to attend, however all patrons must hold a valid ticket to enter the venue. Children 16 and under have discounted entry. Please note that prams are not allowed on the beach. Griffith Opera on the Beach is largely a non-smoking venue, however limited designated areas will be provided where smoking is permitted.